Haunted or Not Haunted? That is the Question. 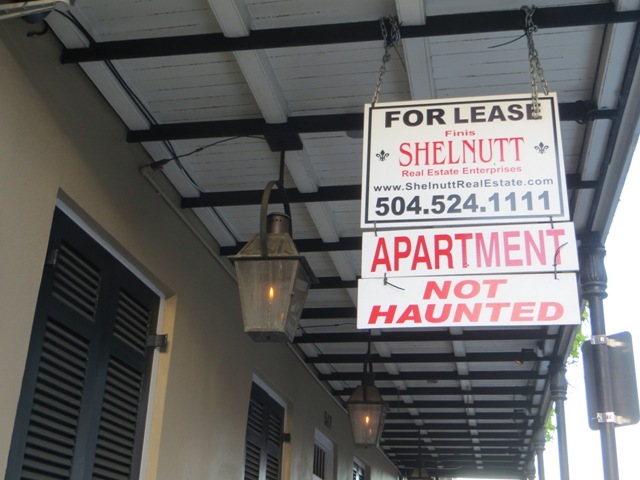 If you want to rent an apartment in the French Quarter, or maybe anywhere in New Orleans, you need to know – is it haunted or not? 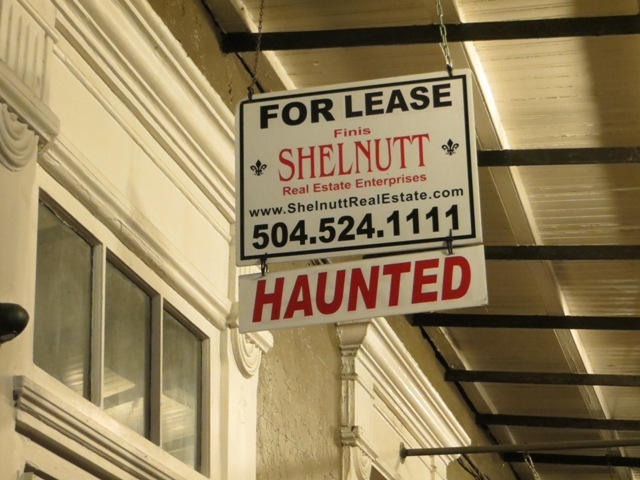 If it’s haunted, that could be a selling point. Or if you’re like me, you won’t care one way or the other. I have never seen a ghost (not counting childhood fantasies of seeing and/or hearing ghosts in the cemetery across the street from my dad’s house – my imagination? Probably.). I think it would be fun to see a ghost. But I remain skeptical about their existence. Regardless, we learned a lot about haunted New Orleans tonight, with a little bit of actual history sprinkled in to keep us in the land of documented evidence. Our tour guide was also our lovely hostess for this trip. Karen owns the B&B where we are staying – Dauphine House. It is a nicely restored two story home in the Marigny, just a couple of blocks down from the northern edge of the French Quarter – which is also considered “down” town because it is downstream in terms of the flow of the Mississippi River. This city’s navigation is not based on your typical cardinal directions. It is all about the river and the lake (Pontchartrain). And given that the layout of the city is far from Manhattan’s nice, neat north-south-east-west grid, it takes some getting used to. I am fortunate to have a good sense of direction and a fondness for memorizing maps. 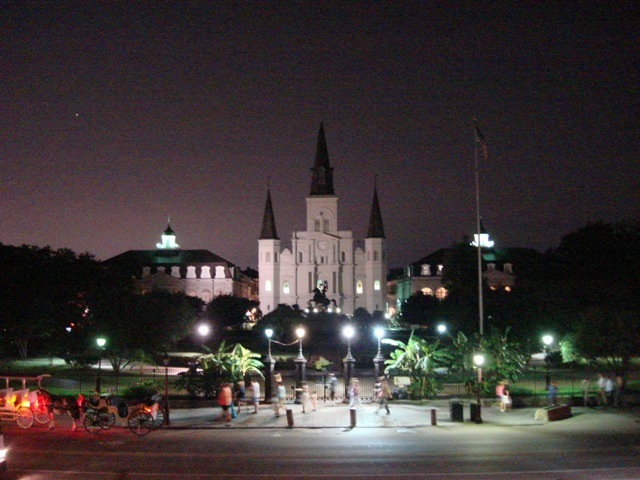 Yet it is the ability to get lost in the non-intuitive, crescent geography of New Orleans that is part of its charm. Getting from point A to point B on the city’s streets, depending on how far you want to go, can often be done on foot. AB and I love to walk, and this is a fantastic city for walkers. There are plenty of sidewalks and gorgeous homes to admire along the way. Just watch your step because many of those sidewalks are broken. But cycling has become increasingly popular here since my last visit in 2010. 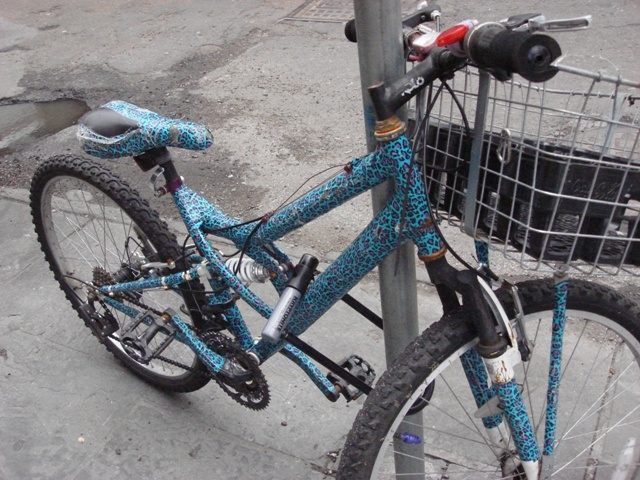 There are many places to rent bikes and all manner of local cyclists – bohemians, brass musicians, hipsters, and middle-aged ladies – getting around on bikes of various shapes, sizes, and aesthetics. Helmets do not seem to be terribly common, but then I suppose most of the streets are narrow and cars tend to move pretty slowly. In general, safety regulations down here appear to be fairly lax. I appreciate that on some level. I often feel that so many of us here in these United States are becoming a bit too safety-obsessed. And sure, it takes all the fun and risk out of life, but more importantly it makes us lazy and less street-smart. We rely too much on external factors to keep us safe instead of relying on our own intelligence. New Orleans is a place that seems to embrace risk – I mean living anyplace where hurricanes are an annual threat certainly qualifies as such – but New Orleans citizens take it to another level. For example, some of the French Quarter’s alleys, like Pirate’s Alley, have drainages running through them to capture water from nearby buildings. They are essentially gutters, but they are in the middle of the street. Someone could trip or twist their ankle. Would this be allowed in Times Square? I doubt it. 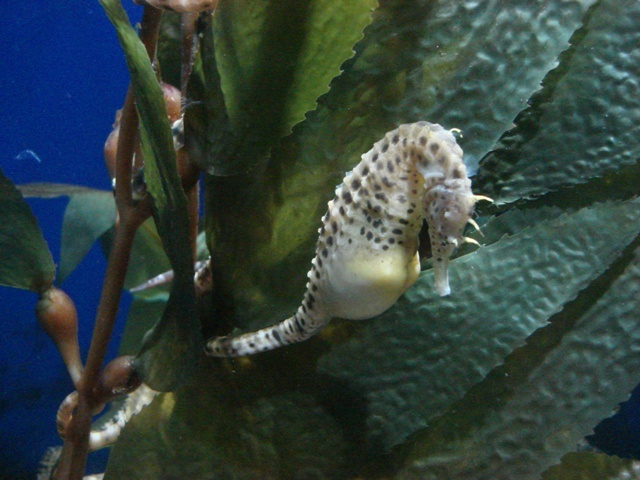 I tried taking a risk by visiting the Audubon Aquarium. I had read that one could pet a baby shark. I am terrified of sharks and thought this would be helpful. Sadly they no longer do it, but AB insisted on taking photos of me standing beneath the fake sharks in the entry way. I reluctantly agreed. 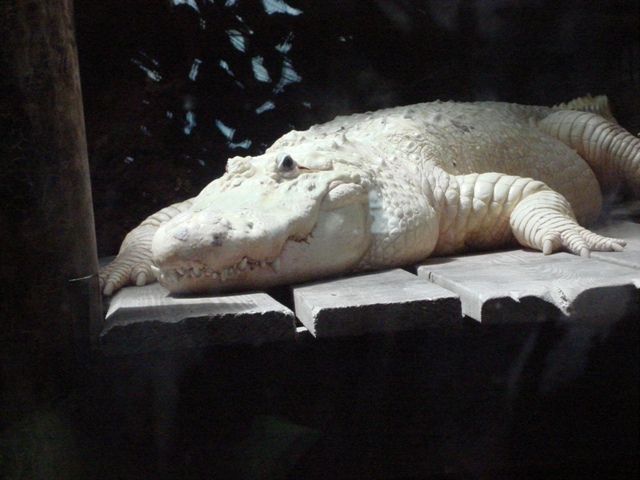 Then we spent the bulk of our time there looking at other creatures such as their enormous white alligator, their awesome penguins, and their super-cute seahorses. 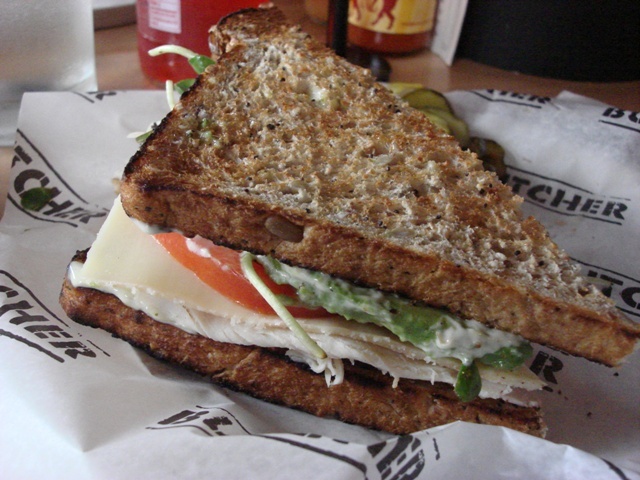 For lunch that afternoon we walked to the Warehouse District and got sandwiches at a place called Cochon Butcher. AB had pork belly with mint and cucumber (good god it was tasty) and I had the best darn smoked turkey sandwich of my life. It had avocado, fresh sprouts, basil aioli, and fontina cheese. Yum! Today before our tour of haunted New Orleans, we went all the way “uptown” (i.e., up river) to Audubon Park to visit the zoo. I have been there before and it has a fun Louisiana Swamp exhibit (with TWO enormous white ‘gators) and an impressive array of non-human primates. They even have spider monkeys – prehensile tails and all. 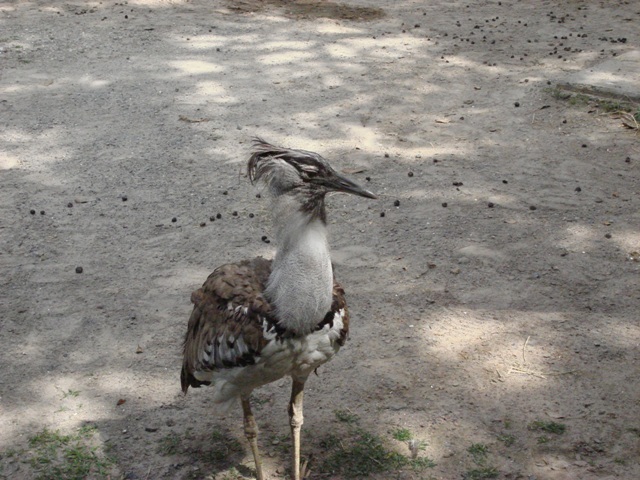 But my favorite animal of the day was probably the kori bustard. I have seen these large birds in Kenya from a distance, but never so close up. They are not terribly colorful, but they are beautiful and fierce nonetheless. 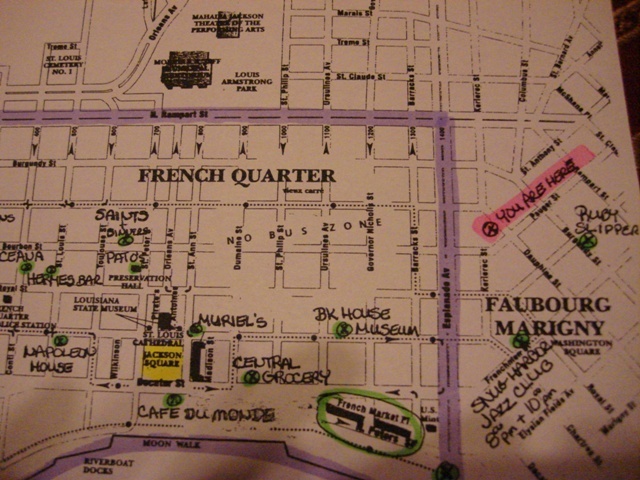 Our haunted New Orleans tour ended at 9:30pm across the street from Jackson Square, so we headed out for a late-night dinner at a West African restaurant on Royal Street called Bennachin. Fantastic plaintains and chicken, but rather unpredictable service – our sweet waitress seemed to be juggling too much and the kitchen was probably a little disorganized. The excellent food made the wait worthwhile. I am a sucker for good food even if the service stinks. And really, she was super sweet. 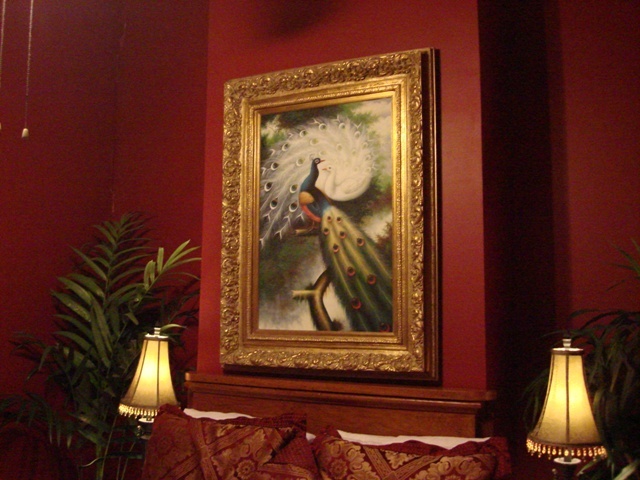 Restaurants in the French Quarter often have a bathroom that is behind the restaurant on the perimeter of a courtyard. You walk out the back door into this courtyard – usually it is open-air, but not always. Then you walk into the bathroom which is usually in an attached building. Many of these courtyards are old and dingy, but for some reason I love them. Maybe it is the history that is so clearly embedded in the grime. How many people have passed through this place over the decades? How many people died here? Are they haunting it still? 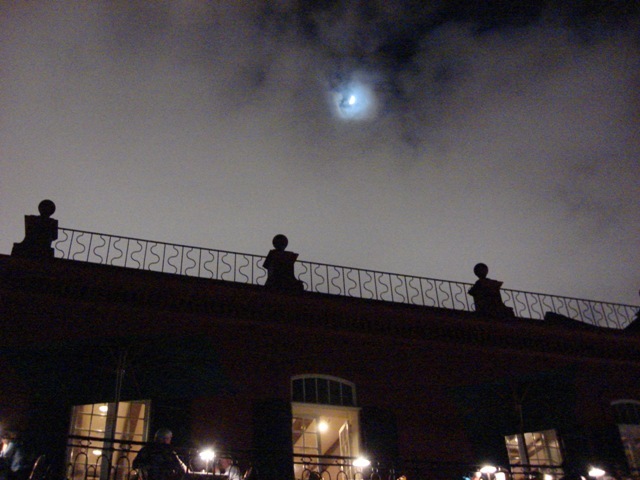 Ah New Orleans, you are so frighteningly romantic. No Travel for Three Years? Lucky Last Night in L.A.
Getting Around In and Out of L.A.